Fresh, fierce and hilarious are words often associated with Stephanie Tisdell. An indigenous Australia who is not afraid to express her thoughts on hardship and racism. 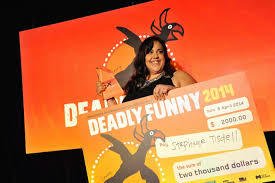 Steph is one of the funniest Aboriginal and Torres Strait Islander talents in Australia. She gained popularity at the Edinburgh Festival. Her comedy act can range from Captain Cook and Pualine Hanson jabs to her own personal outlook on how communication, respect and education needs to be modified in modern society. She constantly interacts with her audience as she plays upon on her own Scottish origins and what she learnt during her time in Scotland. Steph creates a warm hearted connection of her youth with dealing with her mental health during the time. Steph explores the hardships of dealing with the oppression that her ancestors have suffered through and her smart sense of her characteristics that make her unique allow her to grip complicated material and secure more gigs.